"7th Annual Safety Day and Fly-In" (28 Sep 2017 10:00 AM - 2:00 PM, Tampa International Airport). Your company logo will placed on the website, publications, and handouts for our event. 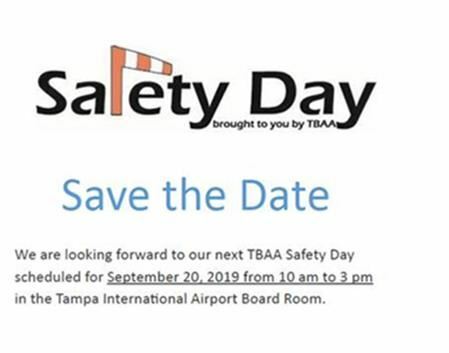 TBAA is pleased to announce Safety Day 2019 is here! We will hold this event at the Tampa International Board room next to Airside A departure gate of the main airport terminal. Visit our website for up to the minute schedule! For more information, please contact Marilynn Gauthier at vice_president@mytbaa.org or call 813-927-7571.